Vareniki (varenyky, pirogi) are stuffed dumplings from Ukraine made from unleavened dough and different fillings. Some of the more popular fillings are vegetables, boiled potatoes, salted cabbage, baked pumpkin, fruits and berries, meat, mushroom, cheese, poppy seed or buckwheat. My favorite fillings are meat, potatoes with onions and mushrooms, cottage cheese or curd cheese and cherries. Vareniki with berry or fruit fillings usually are topped with a little sugar and served with fruit syrup. A few basic rules: the dough should always be elastic. Vareniki should never be allowed to stick to one another during cooking. Vareniki are served hot with sour cream, shkvarki (fried pieces of lard), butter or syrup separately. Vareniki with potatoes and mushrooms are served on top with sautéed mushrooms and onions. This dish along with borscht is considered typical in Ukrainian cuisine and are often mentioned in Ukrainian folklore. Vareniki has worldwide twins: pelmeni (Russian and Ukrainian cuisine), dumplings, manti (Turkic cuisine, as well as Hejaz and Caucasian, Central Asian and Chinese Islamic cuisines), kolduni (Belarusian and Lithuanian cuisine), ravioli (Italian cuisine), khinkali (Georgian cuisine) are all close relatives to the vareniki. 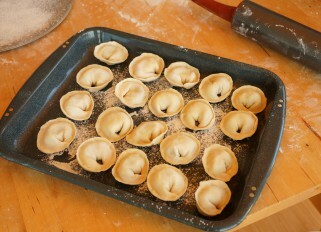 There is also lazy vareniki, shaped dumplings made by mixing tvorog (curd cheese) with eggs and flour into quick dough. The cheese-based dough is formed into a long sausage about 2 cm thick, which is cut diagonally into gnocchi, called halushky (halushki) in Ukrainian. They are quickly boiled in salted water and served with sour cream, jam or melted butter. Usually we’re making vareniki and pelmeni with my mom. This process is long, takes no less than 3 hours, but you can make a lot of them and part can be frozen for later. They can be enjoyed as an appetizer, main dish, an entrée, or as a dessert.